22.09.10 - VISITORS to the GlenDronach Distillery in Aberdeenshire this autumn can now fill their own special bottle from the Distillery Manager’s Cask. Alan McConnachie has personally selected a cask for bottling - and people visiting the distillery can take home a unique malt they have personally decanted from the cask. 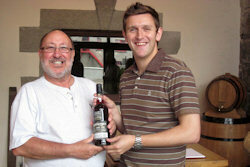 Alan has chosen a single cask GlenDronach (No. 564) distilled in 1993, aged for 17 years in an Oloroso sherry cask and bottled at cask strength 58.4% vol. Each bottle is hand-labelled by the visitor, hand-numbered and signed by Alan. A record is then kept in the Distillery Manager’s book. The bottles are exclusively available from the GlenDronach Visitor Centre at £66.99 per bottle. GlenDronach Distillery, Forgue by Huntly, Aberdeenshire AB54 6DB. Our picture shows a recent visitor, Mr Jimmy Cairns (left) from Falkirk in Scotland, with GlenDronach’s Alistair Walker, after buying the 1993 bottle, with Alan McConnachie’s cask in the background.